So first off I want to say that I’m not the Vetruvian expert, though I do nearly have them at max level for that sweet Prismatic Ciphyron (okay I never use prismatics, I admit it) as the last faction to get there. On top of that Ciphyron is one of the generals in the game that do need some specific higher rarity cards, and probably some time investment to get to terms with him, and my time playing him is quite limited. That said I think this deck shows some powerful cards and synergies despite having almost 2k spirit going into 2 legendaries that I feel are very important for showing off why you may want to run Ciphyron over a different General. Honestly the list should be fairly straightforward, open up with some golems, then follow up with some more stats on the board in the following turns. Keeping your metallurgist alive is nice, but don’t just sit it in the backline if it can be useful in fighting on board. On 5 mana your removal unlocks, Blood of Air and Sandswirl are incredible single target removals and should let you keep up with any opponent that is trying to drop single threats. Ciph has a defensive BBS that can slow down the game, which means that some of the expensive control cards work well with him, he also has a sabotage subtheme that we’ve tapped into with the powerful Grapnel Paradigm. Therefore we have a couple of mid/lategame bombs to hopefully put away the game. This is the Golem Package that you will see in Tournament Competitive Vetruvian decks. If you draw them in your opening hand you can dump a large number of bodies on the field very early and draw up when doing so. It is tremendously powerful and also quite flexible. Bear in mind that Dreamshaper isn’t really a good opening play as player 1, which is why I’m also running Healing Mystic (Azure Herald is likely better, Mystic was chosen to keep closer to 3k spirit). Celebrant is a quite nice skill testing card as it let’s the user choose when, where and how to use the extra mana, and can let you access your powerful 5 mana removal early sometimes, or can just function as a very cheap Golem to play. Dreamshaper is incredible draw because it develops a body that can use buffs or such at the same time, whilst keeping you up on card advantage even if it dies to the enemy general. Metallurgist keeps both of these cards efficient, which alone would be enough, but to keep our budget low we’re also running more basic Golems. Hailstone is included partly to keep the budget low and partly to synergise with our other golems; Dreamshaper and Metallurgist. A decent bodies, but not stellar, but should get the job done to fight for board, especially when discounted by Metallurgist. EMP is our final Golem and one of our top end cards, it works as an answer and a threat and can be pretty clutch to come back from certain scenarios. It’s board wide dispel and huge body can swing a game around and put the caster back in charge. This is just a decent card all round that fills some of the holes in the deck, and again is a Golem. After some Feedback from Spammernoob I swapped in Blistering Skorn, a little AoE goes a long way, and this common rarity card doesn’t add to much to the cost of the deck. Great for dealing with swarms, finishing up low HP minions, artifact charges, etc. I’ve written this a bunch of times now for other lists that use Krater and Skorn. Just know that it’s useful to have this option to flexibly impact the board as it deals with a lot of problems. This card can be real strong when it goes off, stealing minions is no joke. It’s one of the reasons to even consider running Ciphyron as his BBS allows this to steal some minions that it’d be otherwise unable to, for a small extra mana investment of course. 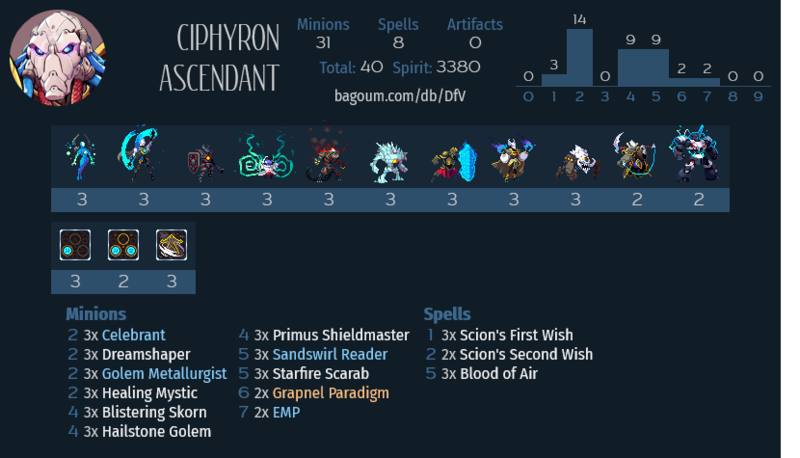 It costs a lot of spirit for a budget deck, but a lot of the Cipyhron payoff cards are pretty weak, this one is not. Getting off a good Grapnel can swing a game for sure. As I mentioned earlier Vetruvian has some of the best single target removal, and that is down to this pair. Reader is great tempo against a lot of targets, removing a body, creating a body and creating a tile that can give value for the rest of the game. It does have certain poor targets, but mostly you’re happy to be casting this. Also you could use it to return a Mystic/Herald if you’re in dire need of extra healing. Also it’s worth considering to move onto the sand tile yourself if you believe they will block it on their turn. Blood of Air is the other part of the duo, it gives less tempo or value, but permanently answers the threat and does so at any range. Often it’s better to prefer to use Swirler where possible earlier, and save Blood of Air for distant threats or cards with powerful Abilities. This is not a rule though. These are some nice simple buffs that can go on whichever it may make sense to stick them, First Wish is just Amazing since it replaces itself, and getting you weak minions extra HP can often mean they survive for an extra attack. Second Wish is similarly nice as it will usually get a chunk of face damage in and then also force the opponent to use removal or their own minions to trade into the target. A couple more basic cards that serve a nice role in support of the deck’s mid and lategame without costing any spirit. Good budget cards. I think the main upgrade route will be to slowly replace the midgame creatures with better ones that are available to Vetruvian. Stuff Like Allomancer/Nimbus/Sirocco/Aymara/SwarmKing, basically your preference for replacing the budget options. Really think the deck is missing Blistering Skorn. Someone asked to test the list with me, and I kinda steamrolled it with eggs :/ A little AoE goes a long way, especially in Vet which has little in-faction AoE but some of the best single target removal in the game. I can do the replacement, I think Skorn is good. What would you take out? I mean if you’re playing a fully built eggs deck against it I’d expect that to win to be honest. Plus I assume you were also the better player. I’d expect these budget deck to be able to make it to S rank in the right hands and I try and play them for a few games to get a feel of them, but they won’t do miracles, and certain generals in particular (Sajj, Ciph, Starhorn, Ziran, Cass, Ilena) pose a bit of a challenge to build on a budget and compromises have to be made. I appreciate your feedback though, and think I will add Skorn and change the title to 3.5k.